“He is the one Englishman of that era who upheld the ancient creed with a knowledge that only theologians possess, a Shakespearean force of style, and a fervor worthy of the saints.” This description of Cardinal John Henry Newman (1801-1890), from the 1913 edition of The Catholic Encyclopedia, captures well three of the many impressive qualities of the man: his theological knowledge, his masterful literary abilities and his holiness. Given Cardinal Newman’s reputation during his lifetime, both for his prodigious intellect and for his personal sanctity, support for his canonization not surprisingly began at his death. His formal cause for sainthood has been underway for some time now, making headlines, at times, even in secular publications. An article in America magazine in 1941, along with Pope Pius XII’s support of the 1945 “Centenary of Newman’s Conversion,” played essential roles in moving the process along. In fact, the Pope had hoped that he might celebrate the Holy Year of 1975 with the beatification of the English cardinal. But more research was needed before that event could take place. Finally, in January 1991, Pope John Paul II declared Cardinal Newman to be “Venerable.” He was beatified by Pope Benedict XVI in 2010, and was approved for canonization by Pope Francis in 2019. Cardinal Newman captured even bigger headlines when, in October 2008, his bones were exhumed and nothing was found save a few red tassels from his cardinal’s hat. Damp conditions had led to the decomposition of the body, thus frustrating the intended move of his remains from a cemetery in Rednal, Worcestershire, to a sarcophagus at Birmingham Oratory. Cardinal Newman had founded the oratory in the 1840s after he left the Anglican denomination to enter the Catholic Church. It was Cardinal Newman’s dramatic conversion that captured, and still captures, the attention and imagination of so many. The teenager experienced a profound crisis of faith in 1816, but emerged from it with a newfound fervor, evidenced by his frequent reception of communion in the Anglican Church and taking a private vow of celibacy. At 21 he was a professor at Oriel College, Oxford, and was ordained in June 1824 as a priest in the Anglican Communion. Newman was a curate of St. Clement’s, Oxford, for two years, and then served as vicar of St. Mary the Virgin, the university church, where he overcame his shyness. Several years of impressive scholarly work followed, including his first major publication, “The Arians of the Fourth Century” (1833). Much of that work had to do with early Church history and the Church Fathers. Such study would eventually lead him to communion with Rome. During the 1830s Newman became a leader in the Oxford Movement, which consisted of several Oxford theologians who addressed key issues relating to the authority, nature and history of the Anglican Communion. They also sought to reinvigorate what they considered to be a spiritually lethargic institution. Because of the many theological tracts published by Newman and others, the movement became known as Tractarianism. In Tract 90, published in 1841, Newman argued that the Thirty-Nine Articles — the defining creedal statements of Anglicanism established in 1563 — were essentially Catholic teachings. This led to controversy and to Newman’s forced resignation from Oxford. Newman retired to the village of Littlemore with a small group of followers and lived a semi-monastic life as he worked on his now-famous “Essay on the Development of Christian Doctrine.” It was during his years there that he worked through his various concerns and questions about Catholic doctrine. He preached his last sermon at St. Mary’s in September 1843, and shortly thereafter he published a retraction of his previous attacks on the Catholic Church. Blessed Dominic Barberi, an Italian, received Newman into the Catholic Church the next day. The following October the new convert traveled to Rome, where he was ordained a Catholic priest and given a doctorate in divinity by Pope Pius IX himself. Father Newman joined the Congregation of the Oratory and, having been given a papal brief, set up an oratory in Birmingham, England. 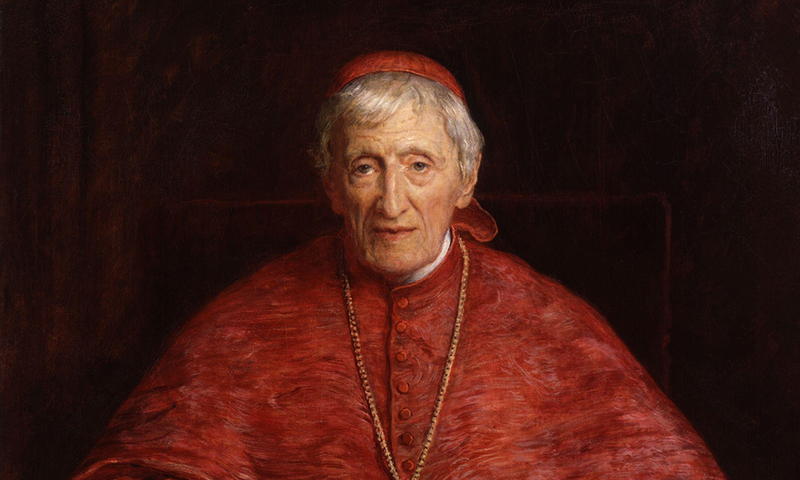 The years of Cardinal Newman’s life were nearly equally divided between those when he was non-Catholic and those when he was Catholic, and the second half of his life, like the first, did not lack for controversy. “Apologia Pro Vita Sua” was published in response to personal attacks against him by novelist Charles Kingsley. In it, he defended the civic loyalty of English Catholics against the accusations of William Gladstone. At the same time, many Catholics remained wary of the new priest, not only because he was a convert, but also because some considered him to be a liberal. This accusation stemmed in part from his concerns about the First Vatican Council’s formal definition of the dogma of papal infallibility. In his “Letter to the Duke of Norfolk” (1875), however, he affirmed that he had always believed in the doctrine. Whatever may have been the qualms of some Catholics about his thinking, in 1879 the convert priest was named a cardinal by Pope Leo XIII. Carl Olson is editor of IgnatiusInsight.com and writes from Eugene, Ore.